What is an electric hospital bed? 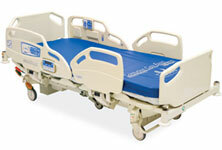 An electric hospital bed is a hospital bed that has the ability to change its position electronically. With the use of a keypad containing buttons, the bed can be adjusted by the person occupying the bed to a position that is comfortable for them. or example, the occupant of the bed may start in a flat, lying down position. They may decide that they want to sit up. With the help of the electronic keypad, the head of the bed will start to move upwards at a steady rate, at the same time supporting the occupant’s upper body and moving them into a sitting position. Then, when they are ready, the bed can again be moved back down. An electric hospital bed’s height may also be adjusted easily. This is especially useful for those who find it difficult to get into bed – the bed can be lowered to accommodate that need. The occupant may have been in the electric hospital bed for a long period of time. In this case, they may wish to raise their legs to stop the fluid from building up through lack of use. The beds lower end may be raised up and thus the occupant’s legs may also be raised above their body, improving circulation and preventing fluid build-up. Why is an electric hospital bed preferable to a regular bed? There are many different reasons why an electric hospital bed is preferable over a regular bed and it is because of this reason that many people are choosing to have electric hospital beds installed within the home as opposed to regular beds. An electric hospital bed gives the occupant a measure of independence where as a regular bed does not. For instance, a person with poor mobility who has difficulty moving themselves may have to wait for a long period of time in an uncomfortable position before someone comes to help them into a more comfortable position. With an electric hospital bed, the occupant can adjust their own position and make themselves as comfortable as they want without the help of others. A regular bed also has only one height and is not adjustable. An electric hospital bed is adjustable and thus if a person has difficulty getting into a high bed, the hospital bed can be adjusted for easier access. An electric hospital bed also has adjustable rails to prevent someone falling out of bed accidentally and causing harm or damage. Regular bed generally has no such feature and as such can be dangerous for an older person or for a person who has poor mobility. Is it expensive to invest in an electric hospital bed? It can be very expensive to buy a brand new electric hospital bed. It is for this reason that many people find second-hand or used hospital beds that cost a fraction of the price of a brand new bed. Some people have even found businesses that specialise in hiring out hospital beds for those who may need them temporarily.